Rational Host Integrated Solutions allows you to start and grow your business fast by leveraging your host data with new solutions to help maximize your total return on investment. The integrated solution allows you to get everything you need to create and deploy advanced business applications that rely on host systems. Whether you want to give your host applications a web look and feel without programming, or integrate multiple legacy applications into a single Web page, IBM Rational Host Integration Solution has the answer. Using both IBM WebSphere Application Server and the IBM Rational Integrated Development tools, you can create and deploy host access business applications. 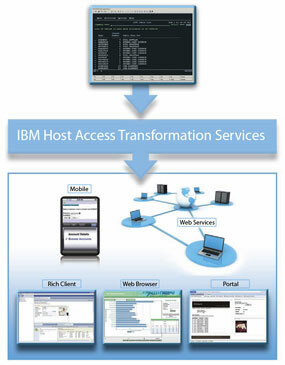 You can use any of the IBM Rational Host Integration Solution programming technologies, such as Host Access Beans for Java and Host Access Class Libraries (HACL), to deliver dynamic host content using Java™ servlets, JavaServer Pages™ (JSP™), Extensible Markup Language (XML)technology and web service components. IBM Rational Host Integration Solution offers industry- leading host access with unmatched flexibility for multiple environments. This solution integrates with and leverages the IBM WebSphere software platform, a comprehensive set of award-winning integrated business solutions that can allow you to quickly meet evolving market needs. Simplifies and accelerates code development and maintenance. Makes it easier to switch between tasks. Improves programmer productivity and efficiency of the development organization.